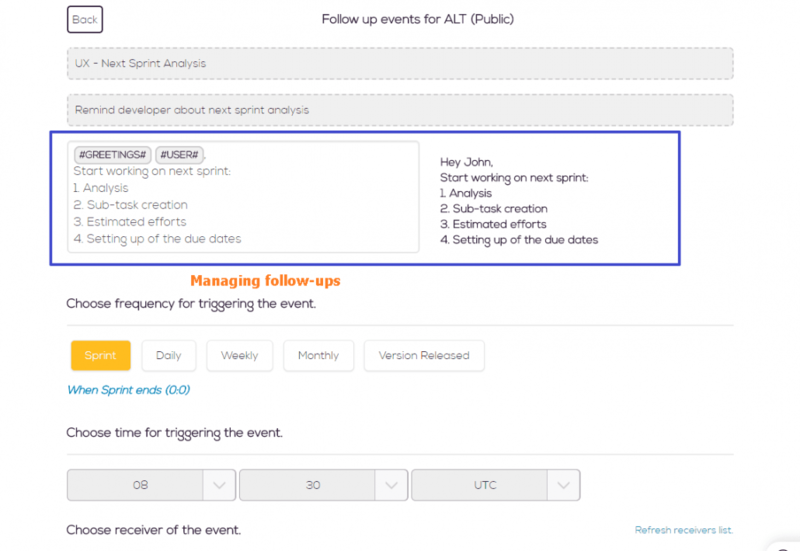 Follow-up events are used to receive static alerts at defined time. They just worked like reminders. You can also trigger these events on sprint start/end or on version released, so you will be able to pass required alerts at right time. Everyone can receive this alert if they are in the receivers list. https://alertly.io/wp-content/uploads/2017/11/alertly-purple-beta-logo.png 0 0 Alertly https://alertly.io/wp-content/uploads/2017/11/alertly-purple-beta-logo.png Alertly2017-10-17 05:32:242017-10-17 05:32:24What are Follow-up events?